Power washing your home the wrong way can fundamentally destroy certain parts of your house. On the other hand, failing to give the siding and roof of your home a deep cleaning can cause rot and dirt buildup, taking away some of the value of your property. The key to cleaning your home with a power washer is avoiding common mistakes. Once you understand how these errors occur, you can effectively make your home look like new again. Let’s look at some of the common mistakes homeowners make — and how you can avoid making these same mistakes. Your home may be sacred, but at the end of the day, it’s nothing more than brick, wood, vinyl siding, and similar materials. Since there is a good chance that your home isn’t made of titanium, you need to make sure you consider the pressure features when power washing your house. Power washers have a variety of different pressure attachments and settings for various jobs and materials. If you are washing your own home, you are going to need to make an educated choice on what will work best. If you do not pick the right settings and attachments, it is entirely possible to put holes in the side of your house. You could also damage shrubs and other plant life near the area you are cleaning. Unsure whether or not you are using the right settings? Don’t risk damaging your house! Check the instructions or contact the manufacturer. When you take a shower you use soap and water, right? Why would you just use water when power washing your home? You need to make sure that you are not just using water when you are running a power rinser for your roof or siding. You are flushing money down the drain if you do not use the proper cleaner — plain and simple. Water alone cannot dig deep into the grim and buildup and get your home clean. If you are going to do the job — do it right! You may think that you can handle using a power washer on the exterior of your home without an issue, but that is not always the case. You should consider whether you have the experience and equipment to handle the task if you need to cover a lot of roof space. It just is not worth the risk of damaging your property if the job is too big for you to tackle on your own. 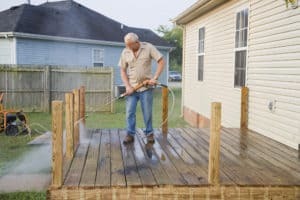 There are experts out there who work solely with power washers, and they can make sure your project goes off without a hitch. You should take advantage of the numerous options available from a professional cleaner. You can also rest easy knowing that the job is going to get done right the first time. Maintaining your property is part of being a homeowner, there is no getting around it. The best thing you can do is make sure that you avoid common mistakes when you clean the outside of your house with a power washer. Are you unsure whether you need a power cleaning expert? Don’t hesitate to contact us today so we can discuss what we can do to make your home look like new again!